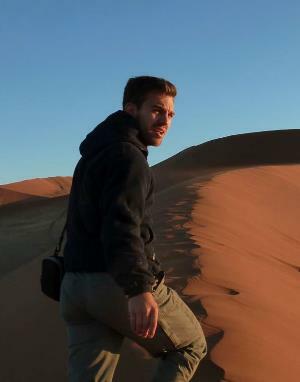 'In 2014 I spent almost four months conducting fieldwork in three different Namibian deserts, in order to quantify the impacts of vegetation on wind erosion. It was an unforgettable adventure, involving stunning 4x4 drives through endless seas of sand, hiking up jagged mountains, and getting the chance to observe spectacular wildlife in some of the world’s most extreme environments. However, there were several challenges to overcome, both ahead of and during the fieldwork itself. 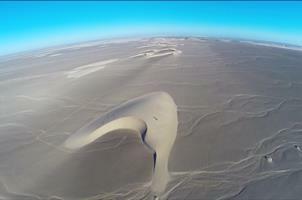 Whilst preparing for my trip, issues ranged from organizing the appropriate paperwork for shipping large volumes of expensive field equipment to various field locations, to informing myself of Namibian regulations on the use of drones, as some of my work involved collecting aerial photography of dunes. Whilst abroad, challenges included the threat of dangerous animals and plants in remote locations (scorpions taking a nap in hiking boots was not uncommon), mitigating accident risk on precarious roads with loose surfaces by strictly respecting lower speed limits and avoiding night drives, getting the car unstuck from patches of soft sand, and protecting unattended monitoring equipment from curious animals and humans. Since my research involved spending a lot of time in remote areas, I had to carefully plan my routes through regions with poor driving conditions and sparse food/water/fuel distribution points. I also made sure I had a reliable, well maintained vehicle and someone to call on if I needed help. As can be expected, heat was an issue, so I invested in some rather fetching hats to protect my head and made sure there were several jerry cans of water in the vehicle at all times. Furthermore, whilst large swathes of desert are seemingly empty, it was necessary to negotiate land access rights with private landowners, particularly farmers, as well as with the Namibian National Parks committee, who regulate access and fieldwork permits in many of the country’s reserves. Luckily none of my field sites were located in malarial regions, but the prevalence of other diseases meant I had to organise immunisations before heading out. Comprehensive travel health advice, vaccinations and prophylaxis can be obtained from the University Travel Clinic. Other useful health advice can be obtained from the Fit For Travel website. Prior to leaving for fieldwork, I attended a course on Emergency First Aid for Fieldworkers, organized by the University’s Safety Office. This was useful for reminding me of the appropriate procedures to follow in case of an emergency, and how best to anticipate any eventualities (e.g. carrying a satellite phone in remote regions, having a fully stocked first aid kit, leaving contact details and work plans with several different people, etc.). I printed and laminated several copies of my emergency contact list, which I distributed in various parts of the vehicle and my luggage and equipment boxes. My supervisor also provided logistical support and advice from afar via email, which helped to allay any concerns as they evolved. It is important to be aware of how much access you will have to telecommunications during your fieldwork, and how regularly you plan to update your supervisor and/or family that you’re still safe and sound!